Orphaned at age 12, in chronically poor health and poorly educated, Alfred Bessette began to wander here and there in search of work. During the ensuing thirteen years, he made his living as a farm boy, tinsmith, blacksmith, baker, cobbler and coachman, often suffering exploitation at the hands of his employers. In 1870, Alfred presented himself as a candidate at the novitiate of the Congregation of Holy Cross in Montreal. Given the name Brother André, he began serving as porter and gardener at Notre Dame College, a post he held for 25 years. Soon the sick and broken-hearted found their way to the humble lay brother's tiny gatehouse for comfort and prayers. Because of his special devotion to St. Joseph, he encouraged his visitors to pray to the saint and many experienced answers to their prayers. Brother André enlisted the help of friends to build a chapel dedicated to St. Joseph, using money he had earned by cutting students' hair. This was the humble beginning of the great Oratory of St. Joseph that today overlooks Montreal on Mount Royal. It remains a popular pilgrimage site where thousands come to pray for physical and spiritual healing. "A daily crowd of the sick, the afflicted, the poor of all kinds—those who were handicapped or wounded by life—came to him. They found in his presence a welcome ear, comfort and faith in God. Do not the poor of today have as much need of such love, of such hope, of such education in prayer?" His feast day is January 6. André was the son of a woodcutter, and eighth of twelve children. His father died in a work-related accident, his mother of tuberculosis, and he was adopted at age twelve by a farmer uncle who insisted he work for his keep. He was a farmhand, shoemaker, baker, blacksmith, and factory worker. At 25 he applied to join the Congregation of the Holy Cross and initially refused due to poor health, but he gained the backing of Bishop Bourget, and was accepted. 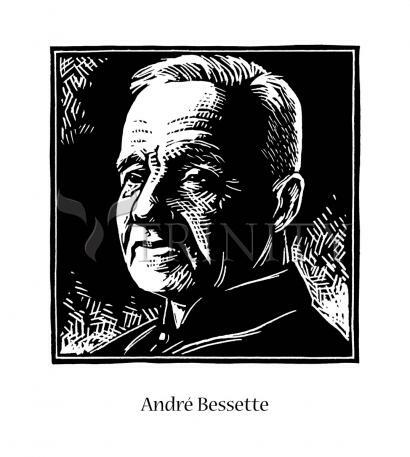 André was a doorkeeper at Notre Dame College, Montreal. A sacristan, laundry worker and messenger. He spent much of each night in prayer. On his windowsill, facing Mount Royal, was a small statue of Saint Joseph, to whom André was especially devoted. "Some day," he believed, "Saint Joseph will be honored on Mount Royal." André had a special ministry to the sick. He would rub the sick person with oil from a lamp in the college chapel, and many were healed. Word of his power spread, and when an epidemic broke out at a nearby college, André volunteered to help; no one died. The trickle of sick people to his door became a flood. His superiors were uneasy. Diocesan authorities were suspicious and doctors called him a quack. "I do not cure," he always said. "Saint Joseph cures." By his death, he was receiving 80,000 letters each year from the sick who sought his prayers and healing. For many years the Holy Cross authorities had tried to buy land on Mount Royal. Brother André and others climbed the steep hill and planted medals of Saint Joseph on it, and soon after, the owners yielded, which incident helped the current devotion to Saint Joseph by those looking to buy or sell a home. André collected money to build a small chapel and received visitors there, listening to their problems, praying, rubbing them with Saint Joseph's oil, and curing many. The chapel is still in use. Died: January 6, 1937 of natural causes; more than a million people paid their respects at his funeral.